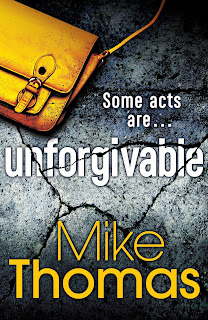 With such an explosive start, the reader is launched straight into the action in Unforgivable, the second book in the DC Will MacReady series. I do usually like to read books in order; sometimes you can get away with not reading the previous books and other times it really is a necessity. For me, Unforgivable just scrapes through into the former; I would have liked to have read the first book but I didn't need to have read it in order to enjoy this one. The first chapter is quite chilling as a bomb goes off in a busy market in Cardiff. A short while later another bomb is detonated in a mosque and across town a young woman is stabbed. As chaos descends on Cardiff, Will MacReady already has a lot going on in his personal life. Will's brother, Stuart, is in court and Stuart's baby is at home with Will's wife, who is also the baby's mother. What a complicated life Will has! It is because of this complex personal story that I would have liked to have read the first book prior to reading this one, but it's certainly intriguing enough to make me want to look out for book one: Ash and Bones. With the city on high alert, Will struggles to keep the press interested in the death of the young woman who got stabbed, Heidi Paxton. Heidi's death is no less senseless than the innocent people murdered at the market and mosque...but is Heidi one of the innocents? As Will investigates, he finds that there is more to Heidi than he bargained for. As he races to uncover the truth about Heidi, time is ticking and the next Cardiff attack is imminent. Can Will stop it in time? Unforgivable is perhaps not quite as fast paced as I expected, but it certainly kept me engrossed and eager to turn the pages. I loved how the book was sectioned into days as it brought added realism to the story. It is a highly detailed police procedural thriller and I loved the banter between the police officers; I sometimes felt like I was a fly on the wall inside a police station. Some chapters are told from the point of view of the bombers and these chapters really are quite chilling as they go about their lives with their true feelings hidden from friends and family. I'm sure Mike Thomas has a lot more up his sleeve for DC Will MacReady so I definitely want to pick up the first book in the series before book 3 comes out. I have a feeling that this series is going to be a firm favourite among crime fiction fans, so keep your eye on this one!